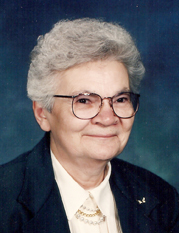 Sister James Messer, 84, a member of the Benedictine Sisters of Annunciation Monastery, Bismarck, entered eternal life in a Bismarck care center on Sept. 25, 2012. Mass of Christian burial is scheduled for 11 a.m. Saturday, Sept. 29, in the Chapel of Annunciation Monastery. Visitation begins at 3 p.m. today at the monastery and continues until the time of the funeral. A wake service will be held at 7 p.m. Friday in the monastery chapel. Mary Ann, a daughter of Jacob and Celestine (Loran) Messer, was born May 6, 1928, on a farm near Antelope. She was the 14th of 15 children. After graduating from high school, Mary Ann took teacher exams and taught two years in a rural school. Here she discovered her passion for teaching. This is what she did most of her life - taught people of all ages about a variety of subjects, but especially about the love of God for them. In her autobiography, she wrote about those brief years in the country school. "It was a great life to find children who wanted to learn and they taught me to look for something greater in life." In 1949 this desire for something greater led her to Annunciation Monastery, where she made her monastic profession July 11, 1951. She was given the name Sister James. She lived 61 years as a Benedictine sister, always growing in a relationship with Jesus and serving wherever she was called. She taught children in Catholic schools in Mandan, Mott, Dickinson and was principal of Cathedral Grade School, Bismarck, for six years. She was religious education coordinator at St. Mary's Parish, Bismarck, and also served as pastoral minister at St. Charles Parish, Bowman, and at Queen of Peace Parish in Dickinson. She was vocation director of Annunciation Monastery and pastoral care minister at St. Benedict's Health Center, Dickinson. Sister James loved people of all ages. From her life's experiences, she understood suffering and showed compassion, understanding and sympathy to those she taught and those to whom she ministered in the parish and at the health center. her humor brought smiles to many. She also knew the importance of listening with her heart. "So much healing can be done with listening," she said while being interviewed for an article for St. Benedict's Health Center. Sister James had a certain determination about her, held strong beliefs and was highly organized. She often went out of her way to help people wherever she could. She loved her large family gatherings, where she could enjoy their company and visit and laugh with them. Sister James had a deep faith in Jesus, especially in the Eucharist. She found strength in receiving Jesus in communion. She sought to live her life as a witness to the love of Christ and encouraged others to do the same. She is survived by a sister-in-law, Eugenia Messer, Dickinson, many nieces and nephews and the Sisters of Annunciation Monastery. Father Daniel, family, friends and my Benedictine sisters --- Sister James made it crystal clear what she wanted us to speak about during her funeral liturgy. Her words were always direct and to the point, why should it be any different at her funeral? She knew exactly what she wanted emphasized. The readings and hymns she chose for today echo again and again that the theology of the Body of Christ was the driving force in her life. The Body of Christ - Jesus present in the Eucharist and Jesus present in all of us. This is what Sister James believed with her whole heart and she acted out of this belief. The Gospel she chose particularly reinforces this. Jesus says, “Those who eat my flesh and drink my blood abide in me, and I in them.” The presence of Jesus in the Eucharist and Jesus abiding in the People of God calls us to treat each other with love. This was a core belief for Sister James. She sought to teach and live this wherever she served. She did this as an elementary teacher in Mandan, Mott and Dickinson - as principal of Cathedral Grade School - pastoral minister in Bowman and Dickinson - as pastoral care minister at St Benedict’s Health Center in Dickinson - with her family and in our community of Annunciation Monastery. Father Gary Benz, who, as a college student, worked with Sister James at St. Benedict’s Health Center pointed out that Sister James proved that faith and fun can go together. We all have our own stories of how Sister James touched our lives. She enjoyed being with people of all ages and particularly had a fond love for her family. She truly relished being with you. All of you were precious to her. Her friends, students and co-workers also had a special place in her heart. A Benedictine sister for 61 years, Sister James valued her call to live as a woman dedicated to God and God’s people. She often lived alone in her ministries. Although she found joy in helping others in parishes, she often wrote letters home saying how much she missed our common prayer and the friendship and companionship of the sisters. Sister James was a woman who knew what suffering meant. Life was not always easy for her. Yet, I believe because she experienced hardships herself, she was able to bring compassion and understanding to others. She always carried the spark of Jesus’ love within her. Sometimes in her years of pain and memory loss, it was deep inside, but it was always there. The second reading from St. Paul to the Corinthians says that we hold this treasure in earthen vessels that the surpassing power may be of God and not from us. Sister James experienced both the dying and life of Jesus in her inner being. Often like most of us, she didn’t like the suffering, but in her final days, it helped her to let go and enter into new life with God. Sister James, we know you drew strength from the Eucharist. Jesus promised that whoever shared in the Bread of Life would live forever. Sister James, we believe you now possess life forever with God, the Father, Son and Holy Spirit. You have that huge smile on your face and are basking in the warm loving embrace of God. Thank you, Sister James, for the gift of your life and presence among us.